I woke up this morning to read accounts of what’s happening in the Standing Rock Indian Reservation with the peaceful protesters and police brutality over the Dakota Access pipeline and this sacred land. If you haven’t heard of what is going on here, please learn more about this. Do note that the U.S. media is not covering this well by not providing full coverage and slanting the events, claiming riots are breaking out among protesters when people are standing in peace. Last night, people gathered with song and prayer over their land as law enforcement deployed water hoses, tear gas and rubber bullets on them. Wondering what you can do? If inspired to take action from your home, you can help HERE. All the while, millions of people continue to struggle with fear, hate and anger over the results of the U.S. election. Suffice to say, some deep healing needs to take place on many levels in many places! One, I realize I haven’t offered a Global Prayer & Reiki Healing Circle in many moons, so I am offering this now. I have decided to keep this Prayer & Healing Circle going continuously, with no end. This is how it works: Simply contact me by leaving a message on this blog post or contact me privately by clicking HERE. You can request healing for yourself, a loved-one, a pet, your home, work, finances, health, for a situation, your hopes and dreams or for anything else you can possibly image that is positive, healing and loving for everyone involved. Feel free to think big here. I also invite you to send any event that is happening around the world to me for healing. To this, I am also adding the entire situation around Standing Rock, the current U.S. political landscape, the millions who are struggling, and the environment along with global warming. This weekend, Amma the Hugging Saint, will be in San Jose, California, and I will be there in meditation with her heightened spiritual energy. I will be sending prayer and healing to everyone and everything in the Global Prayer & Reiki Healing Circle while there, infusing my Reiki with Amma’s powerful, vast, compassionate and incredibly loving energy for deep global and individual healing. Please send your requests now to be added to the Global Prayer & Reiki Healing Circle. Prayer and healing will begin immediately. I will send Reiki to those in the Circle during my morning and evening meditations beginning today and continuing forward. Secondly, I simply want to share a message to stay balanced in your own heart and connected to your spiritual center despite what is happening around you. I am reminding you to be in the sacredness of the moment. I cannot express how valuable this is right now. Take 1 minute right now. Breathe deeply and simply BE in the current moment. There is beauty and peace found within right where you are. 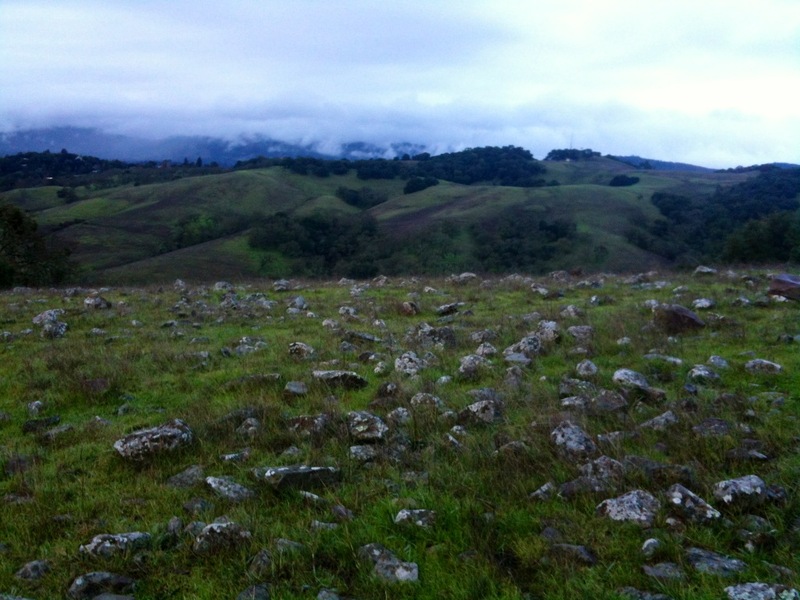 I hiked around the mountain where I live in Sonoma County. 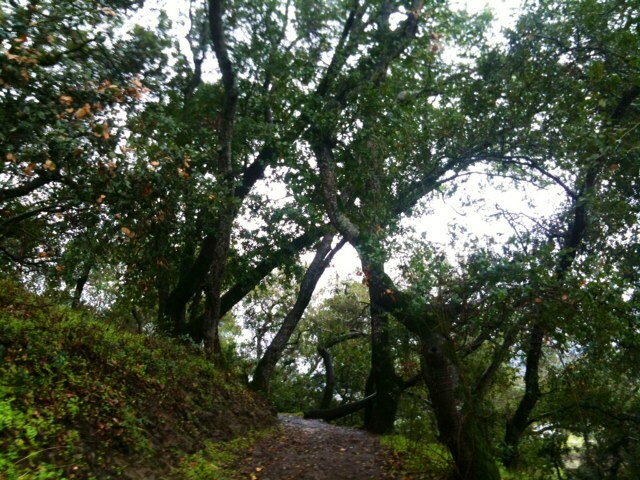 It rained, and the first thing I ever want to do when it rains is get into the forest and walk among the elementals. I count my blessings every day for this magical land. 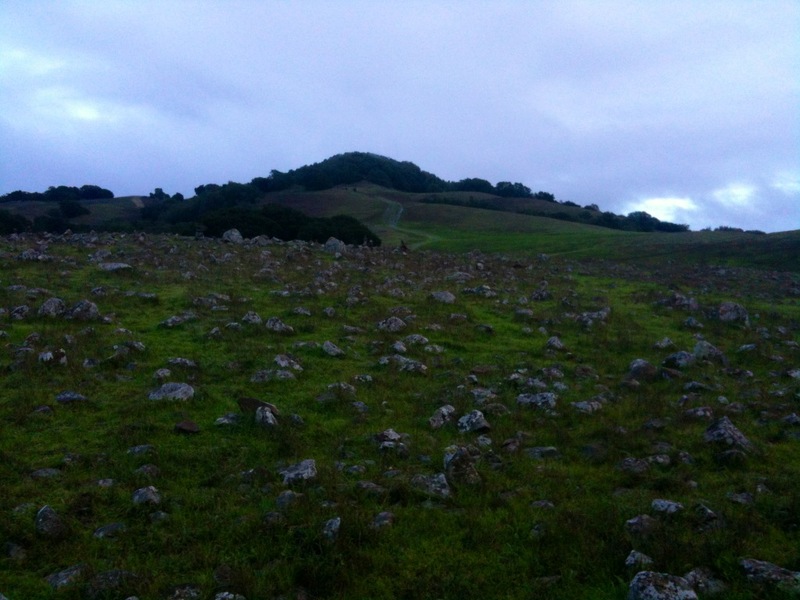 It is from this mountaintop that I send most of my distance Reiki healing energy around the world during my private sessions. 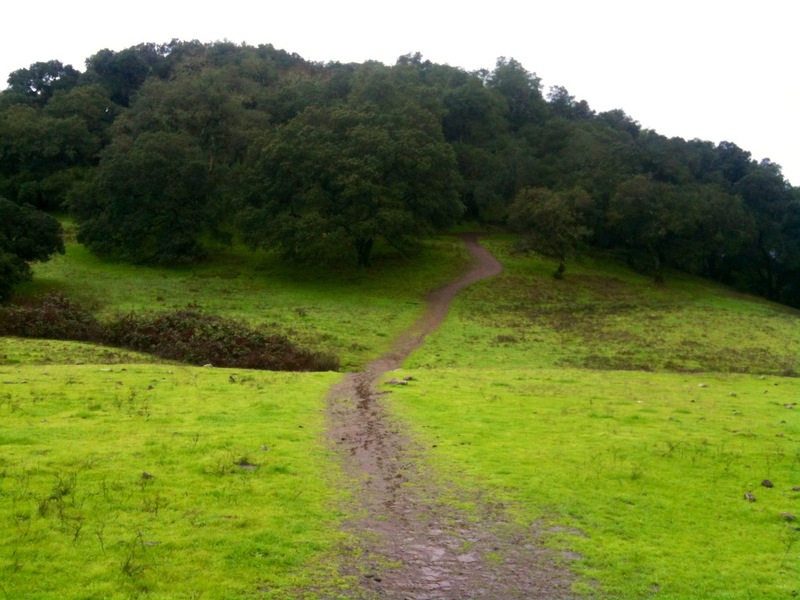 I am grateful for the recent rains that have turned this once summer-blonde mountaintop to emerald green. 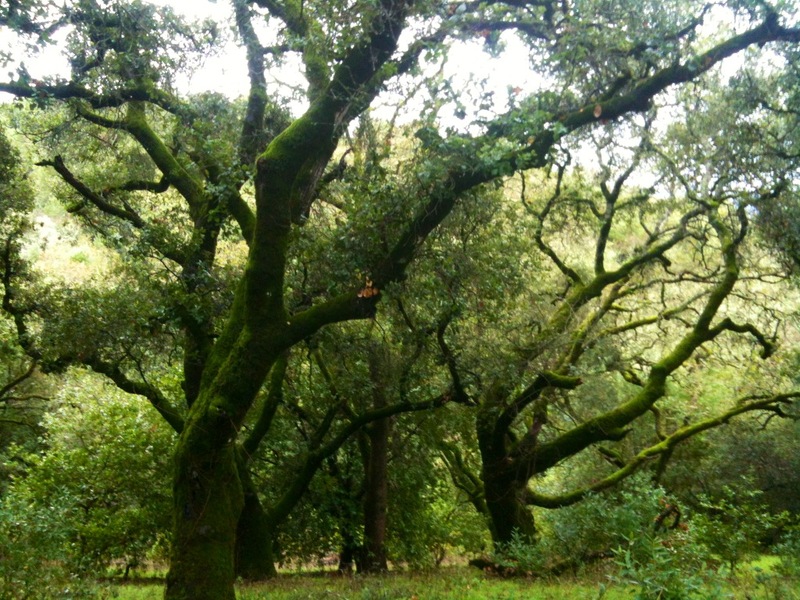 I am grateful for the twisted, old, wise, oak trees that thrive on this land. 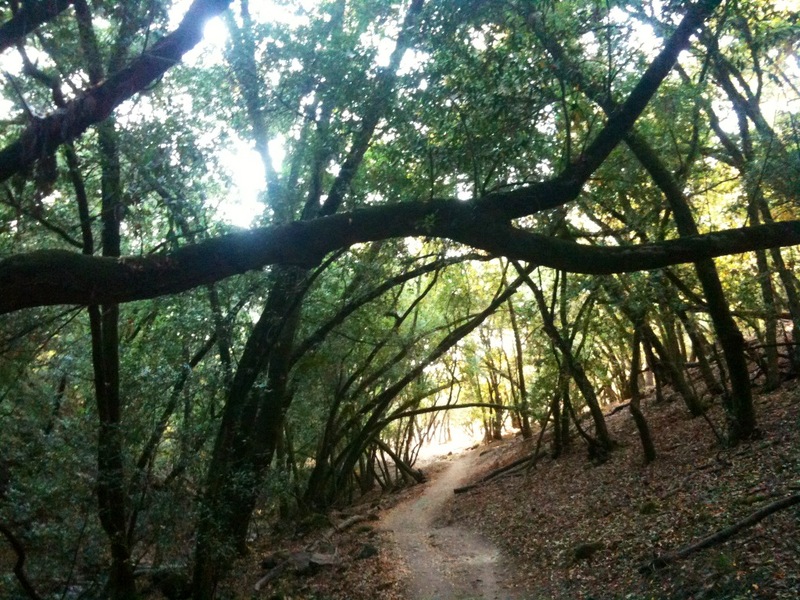 I am grateful for enchanting forest trails. I am grateful for troll bridges in magical places. 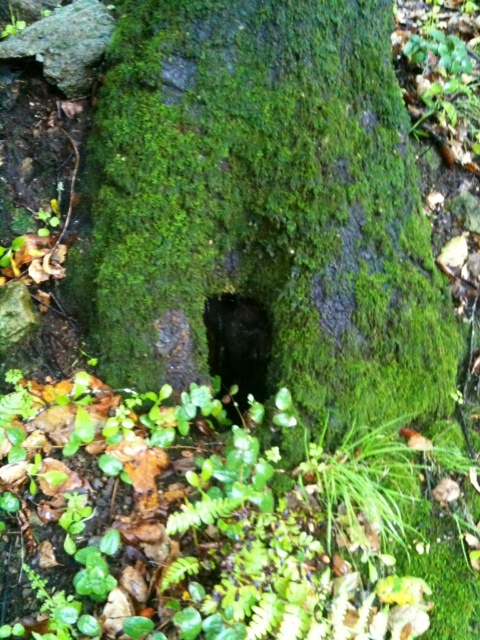 I am grateful for Faerie portals. 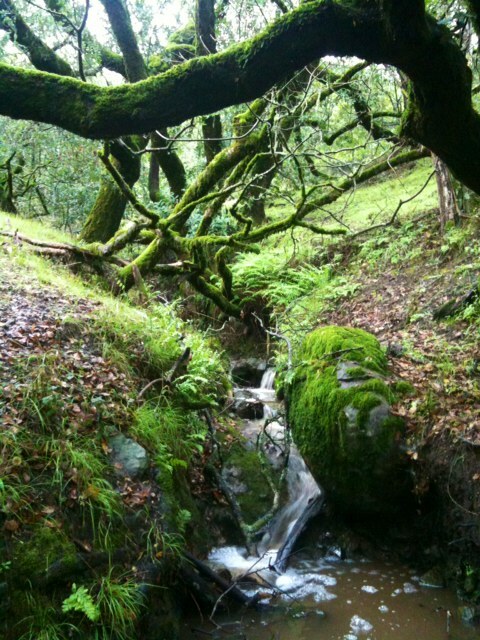 I am grateful for waterfalls and creeks nestled among mossy trees. 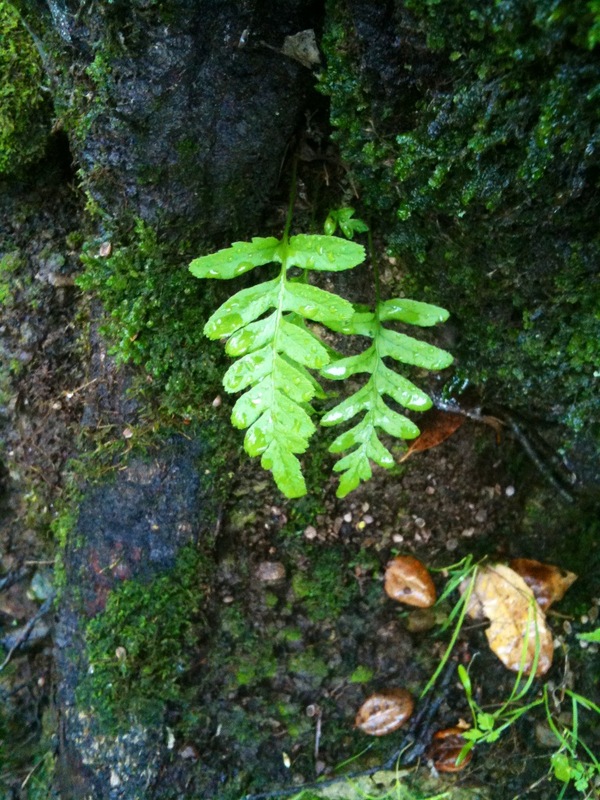 I am grateful for rain-kissed ferns that wave me into the forest. 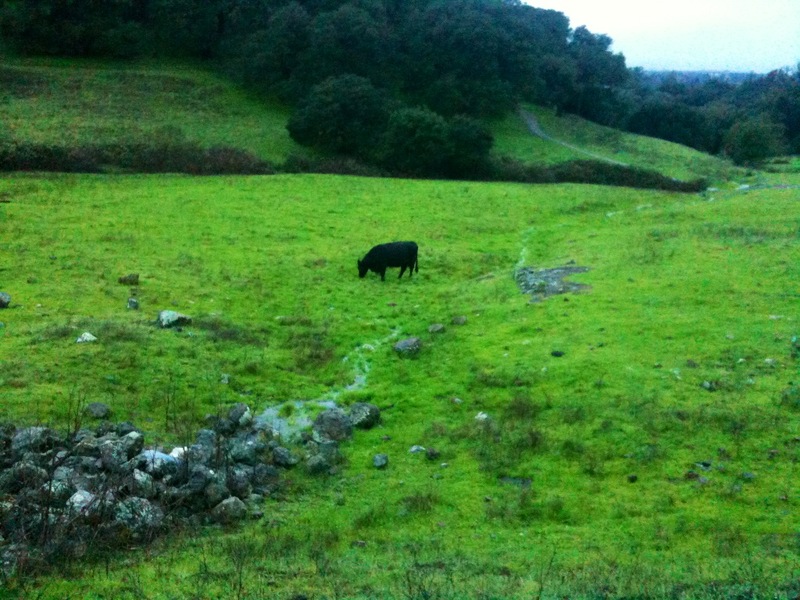 I am grateful for the presence of gentle sentient Beings like cows. I am grateful for the beautiful reminder to always look up. 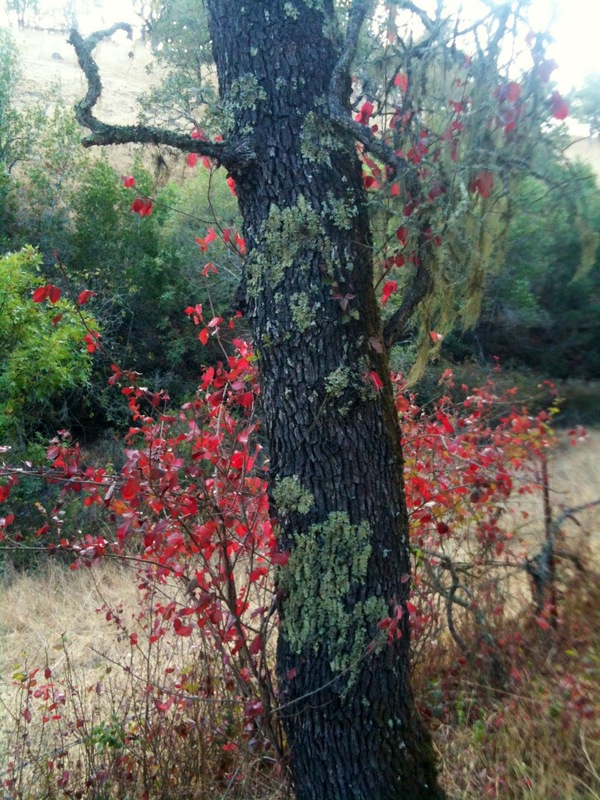 I am grateful for the vast beauty that is all around when I take the time and BE with it all. 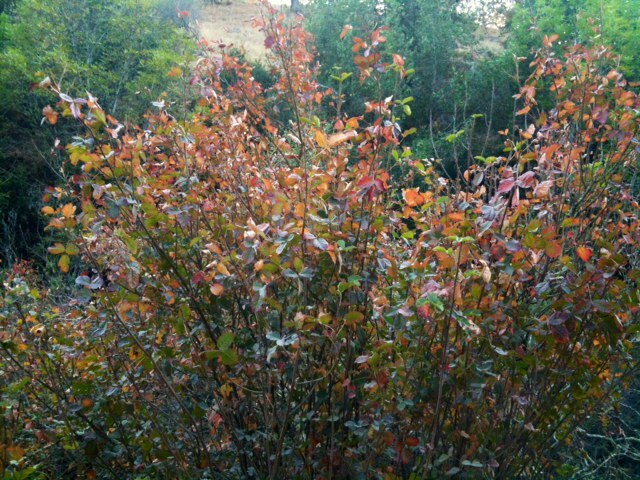 Autumn is my favorite season, and it is upon us! September 22 at 7:22am PST is the autumn equinox, where light is in perfect balance and the magic of a new season begins to stir. (It also happens to be my birthday- hooray!) 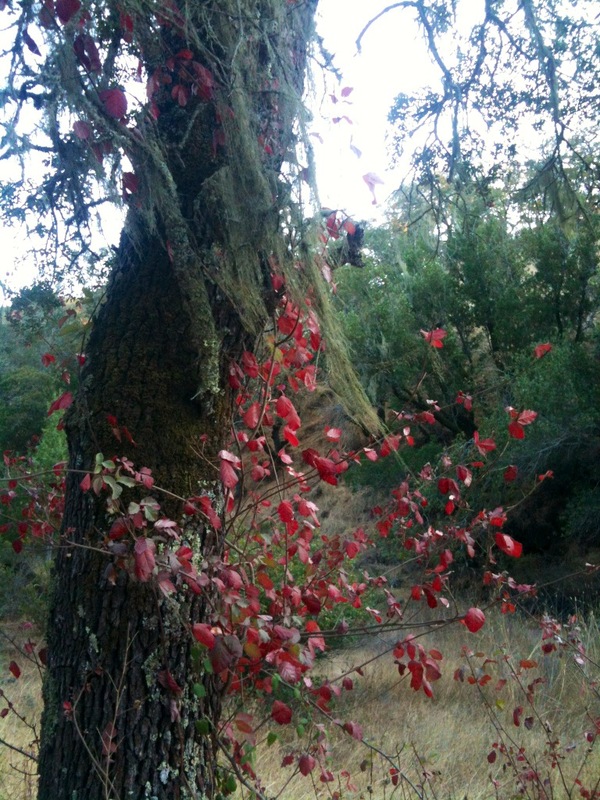 To celebrate this enchanting time of year, I am sharing a few photos I casually took recently on a woodland walk near my cottage in Sonoma County. 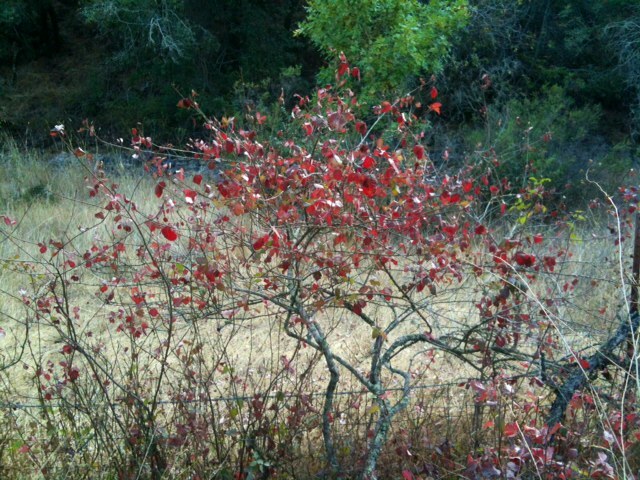 I am in love with the changing colors, the crimson, amber and russet tones that are beginning to enrobe the natural world. 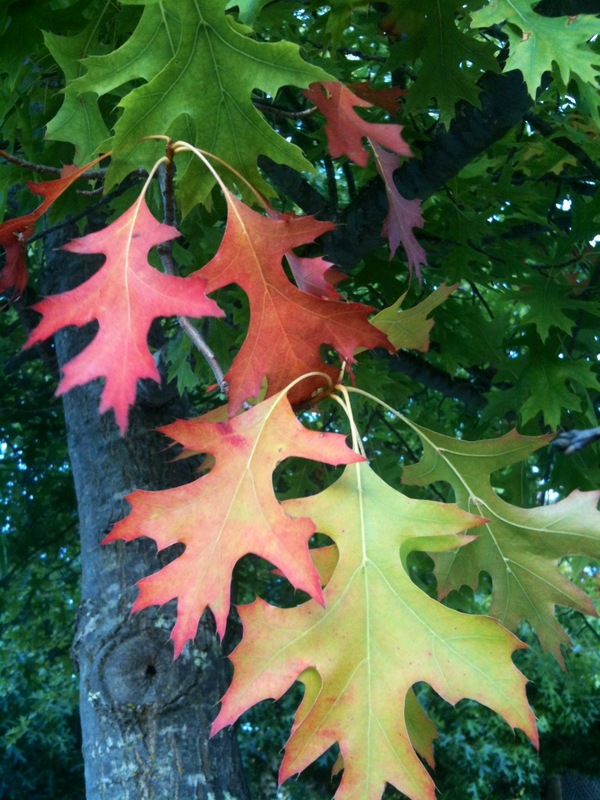 It is clear that the beautiful alchemy of autumn is well underway. Enjoy this magical time. The moon is in its waning phase, so think of all the things you are ready to release that no longer serve you. Write it all down, burn it to ash, give it all to the winds to whisk away like dried, fallen leaves. It’s a time to refresh, to embrace positive change, to invite beauty and magic, and to embrace this season as a personal harvest of all things wonderful. 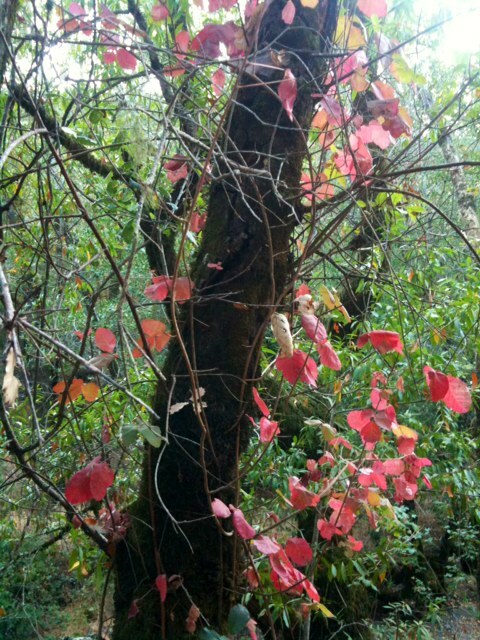 Autumn blessings to YOU in love and enchantment! 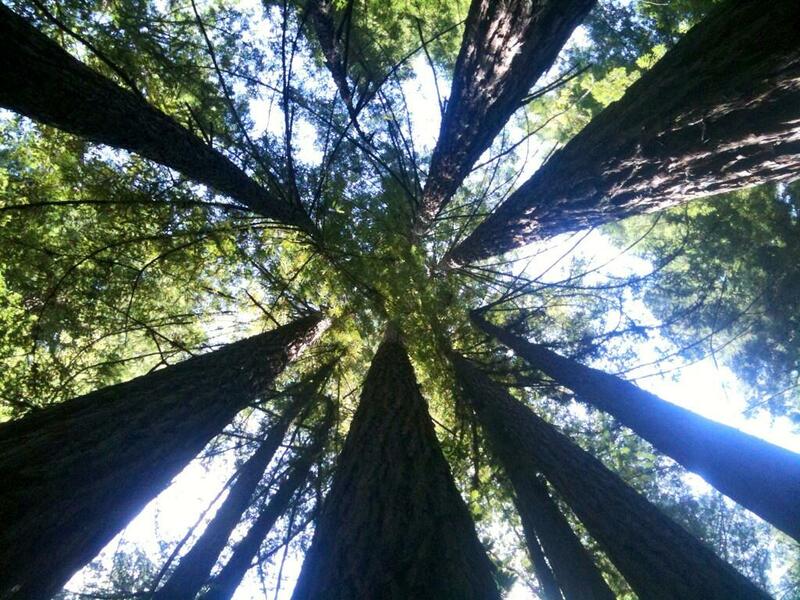 I have been teaching certified Usui Reiki classes in Sonoma County, CA, for many moons now. With all things in life and in livelihood, it is time to expand and grow. With this being said, I have an exciting announcement about a new group I am co-creating for all healers and lightworkers. I have recently aligned energies with a soulful, like-minded practitioner, Barb McEntee, to create and co-lead a new spiritual group called the Healer’s Ascension Network. Barb and I originally met through the Songbird Healing Center in Cotati, where I am currently a supporting member and Shamanic Reiki practitioner. We are both energy-workers and spiritual coaches who have much in common. We both work with theta and angel energy, we are each highly intuitive and we each work from a place of unconditional compassion, abundance, non-ego, non-judgment and authenticity. We have a deep interest to support other healers in doing the same in business and in life. Lately, I have been getting spiritual nudges to write a book on how to start a private practice. I wanted to share my own secrets and strategies for launching and sustaining a successful healing business. I often see healers struggle with poverty-consciousness, a sense of competition and lack of work. My desire is to share a step-by-step process on how to get started from social networking, finding a location to work from, advertising, to setting positive intension and so forth. When Barb approached me about partnering up to create, teach and lead a group class, supporting other lightworkers in their growing practices, it completely resonated and felt perfectly aligned with my own work! What has evolved from Barb and I joining energies is our new group called the Healer’s Ascension Network. This evolved network is for all healers, lightworkers and anyone interested in creating a thriving spiritual business or personal practice. Our Ascension Circles include an opening meditation/spiritual ritual, an educational discussion on various topics aligned with conscious business and spiritual development, and a shared group healing to heal the healer. This is a sacred space designed to compassionately guide you past blocks you may be having in your practice while awakening you to a new paradigm of intension, process, and success. You are warmly invited to join this supportive circle, share your craft, and co-create an expanding network of ascended healers. 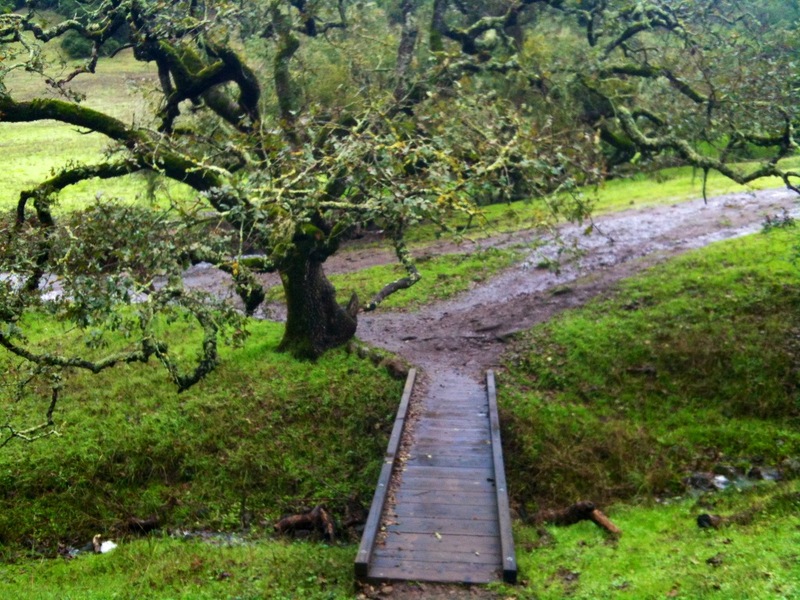 The Healer’s Ascension Network meets in Sebastopol, CA, starting November 3, 2015. Mark your calendars and get ready for some magical nights of sacred ritual, shared healing modalities, engaging fire-side discussion and lots of fun! Our first of many gatherings, which we are calling Ascension Circles, will focus on Manifesting and Setting Intensions. There will, of course, also be time for networking, sharing and participating in spiritual, meditative ritual. 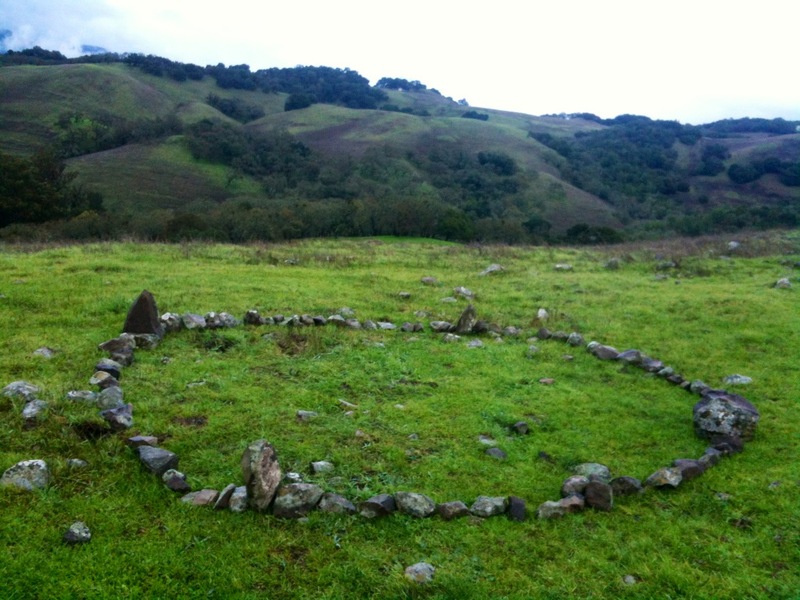 Our Circles are held in Sebastopol, CA, in a beautiful space filled with crystals and lots of loving, high-frequency angelic energy. It is synchronistic that our first Circle is taking place on November 3rd right after Samhain, the Celtic New Year. Because of this, it’s a perfect time to set our positive intensions and our energy on what we wish to create in the new season and year ahead. Abundant angelic blessings to you! I have something special I would like to share with those of you who have an interest in sending distance Reiki or have (or will) complete a Reiki II class. When I teach Reiki II, I like to have my students practice sending distance Reiki using a pillow or a doll as a model to represent the person intended to receive the healing energy. This is a physical way for a person to send energy to an absent recipient and can often make the process easier to conceptualize and perform. With this said, I have a dear student of mine who I taught the Reiki I, II, III and Master Teacher levels to years ago. Her name is Kimm Abercrombie, and she has designed a wonderful way to help Reiki students and practitioners to more tangibly send distance Reiki. 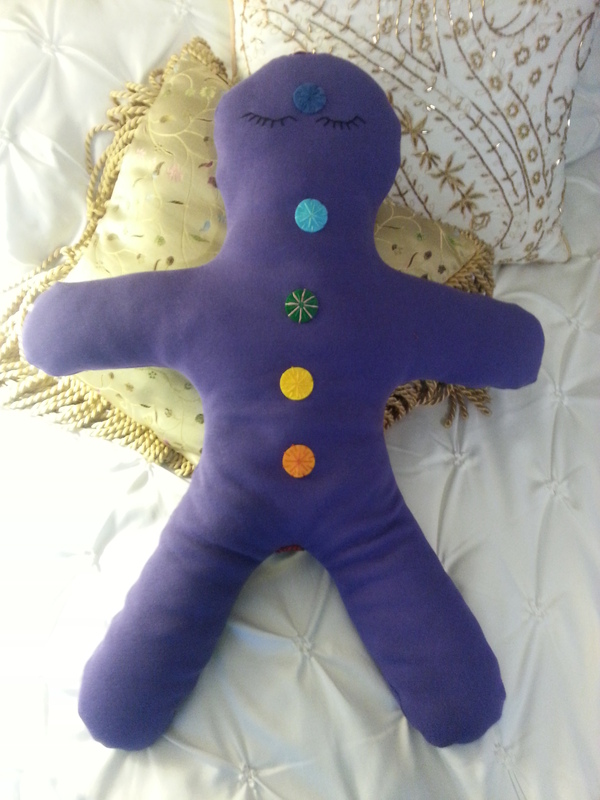 She has handcrafted a Reiki doll for use during distance energy healings. I now use her doll during my Reiki classes as a model for my own students. 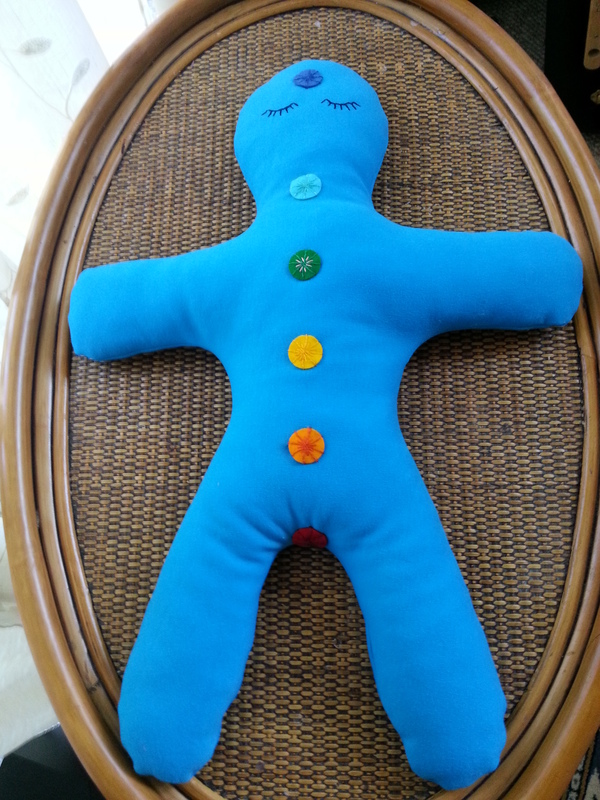 The beginning ideas for the doll came with my inability to connect with a teddy bear or doll for Reiki distance healing. I kept thinking that there could be a tool with a more neutral identity to transfer intention to different subjects. The shape was inspired by gingerbread cookies and a toy that my son had as a child. The larger size, I felt, was much better to be able to use more standard hand positions and inspiration for new ones. I wanted it to be made of all natural materials as much as possible. The idea was to empower the Reiki flow with color and crystals. The body is made of 100 percent cotton, stuffed with bamboo fiber. The Chakra discs are 100 percent wool hand embroidered with pure cotton thread. I clear the crystals corresponding to the Chakras with sea salt and sew them to the doll with Reiki constantly flowing. I have found that it strengthens intent and flow as have my Reiki students that have used it for some time now. I have decided to charge $85.00 for the doll after comparing it to others of a similar kind on ETSY. Due to its size and quality, I feel that this is still a very reasonable price. I would be happy to give a $10.00 discount to your students. But there would still be a ten dollar shipping and handling charge. I am happy to make them to order as to color and crystal choice. 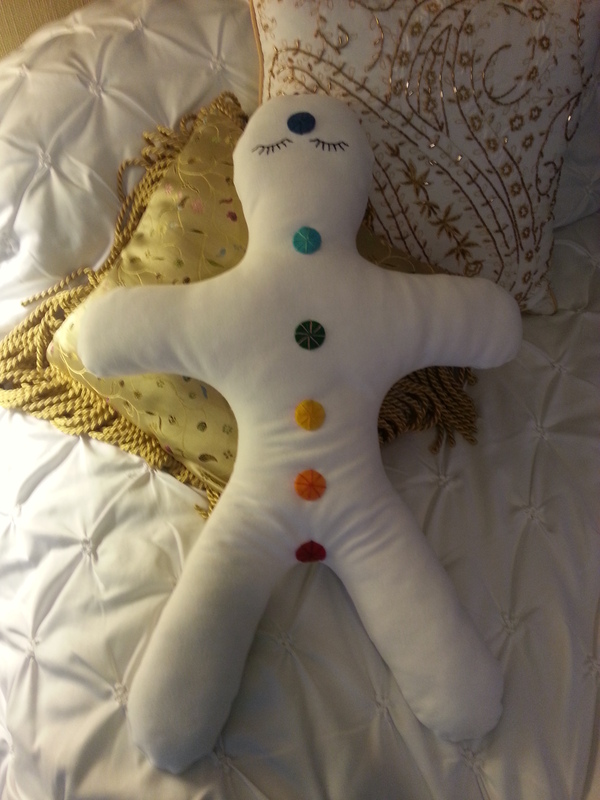 If you are interested in learning more or would like to order this Reiki doll, please contact me HERE. I will happily connect you with Kimm. I wish you all lots of love and light and Reiki success. May your healings and higher learning be profound and may your spiritual endeavors flourish.